What do sugar cookies, eggnog, chocolate truffles, and festive fudges have in common? They’re all certainly delicious holiday treats, and they can also add on extra inches to your waistline this time of year. 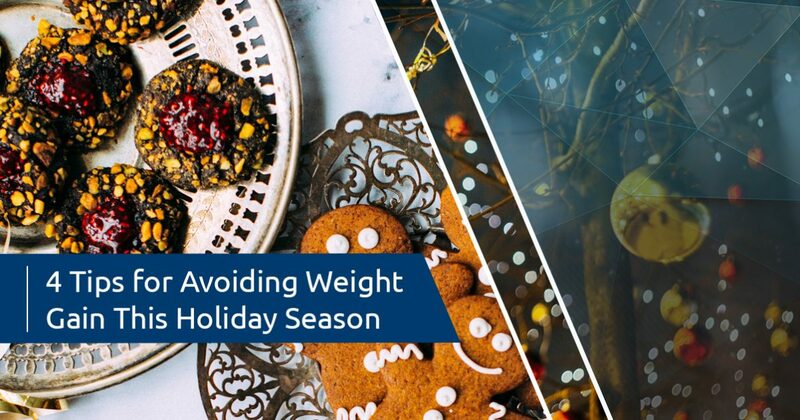 In today’s post, we’ll take a look at four easy ways you can avoid gaining unwanted weight this holiday season. If you would like to learn more about testosterone replacement therapy, weight loss programs for men, or any of our other men’s health services, then get in touch with us at 520-399-6574 or fill out our online contact form. Between shopping, wrapping gifts, traveling, and hosting family and friends, it’s easy for your health and fitness routine to fall by the wayside until January. While it’s completely expected that your routine will get interrupted during the week, you should try to maintain some structure during the week. Try to exercise at least three days a week, and if you know that you’ll be attending a holiday party on the weekend, then try to be more rigid with your diet during the rest of the week. Numerous studies have shown that we eat more when we use larger plates. This finding isn’t too surprising, as most of us have been taught to completely fill our plates before sitting down to eat. 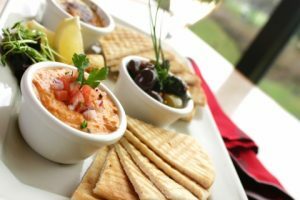 The next time you’re hosting or attending a party, see if you can use a smaller plate for snacks, appetizers, and meals. Even if you do go back for seconds, you’ll be consuming fewer calories than you would if you had stuck with a larger plate. If you’re trying to minimize your cheat days this holiday season, then consider making a healthy meal, snack, or appetizer to bring to holiday parties. There are plenty of delectable dishes you can make without sugar and processed ingredients, and other health-conscious attendees will appreciate your efforts. Whether it’s veggies and hummus, roasted Brussels sprouts, a low-carb chicken dish, or another one of your favorite plates, you’ll thank yourself the next morning when you don’t have to climb back on the wagon. As we noted in a previous post, your sleep and your testosterone levels are inseparable. Almost everyone knows that sleep deprivation leads to crankiness, brain fog, and other cognitive issues, but did you know that it takes a physical toll on your body as well? In addition to reducing your testosterone levels, sleep loss increases ghrelin, the hormone that increases our desire to eat, even if we’re not actually hungry. 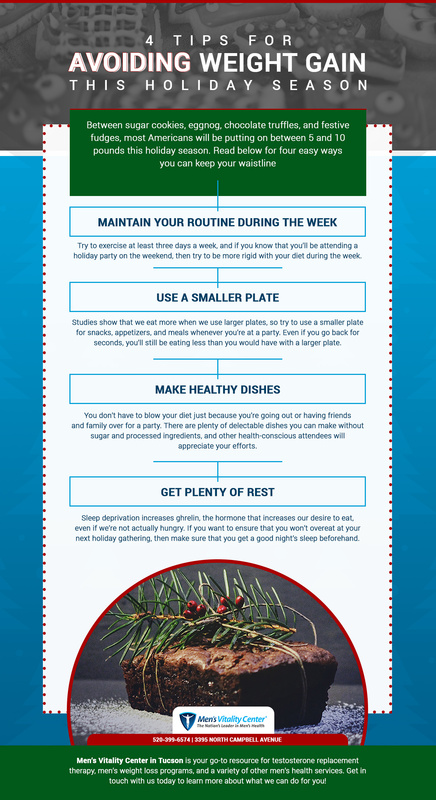 If you want to ensure that you won’t overeat at your next holiday gathering, then make sure that you get a good night’s sleep beforehand. We hope that today’s post will help you avoid gaining weight this holiday season. Men’s Vitality Center in Tucson is your go-to resource for testosterone replacement therapy, men’s weight loss programs, and a variety of other men’s health services. Get in touch with us today to learn more about what we can do for you!